The founders of Bork Design, Inc. and Hall Smith Office, two award-winning and long-standing architecture firms in Georgia, have combined their expertise and created Architectural Collaborative LLC, branded as Arcollab. Arcollab specializes in the integration of thoughtful modern design into existing urban and neighborhood fabric. Our projects range from custom homes to large-scale commercial design and project management. 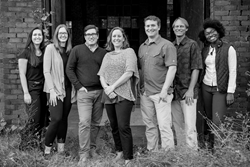 Arcollab is a multi-disciplinary firm, with practice areas including all types of new construction, sustainable design, historic preservation, existing building conditions evaluation, master planning, and preservation planning. Principals Lori Bork Newcomer, Joseph Smith, and Gabriel Comstock will lead the new firm, located in Athens, Georgia. “Arcollab specializes in the integration of thoughtful modern design into existing urban and neighborhood fabric. Our projects range from custom homes to large-scale commercial design and project management,” said Comstock. “The combination of technical expertise in construction detailing, graphics, and documentation, together with inspirational creativity and our commitment to meeting our clients’ needs, sets Arcollab apart,” added Newcomer. Newcomer and Comstock are LEED Accredited Professionals, and have completed projects certified under LEED for Homes, the Southeast’s regional Earthcraft Program through Southface Energy Institute, and Energy Star. The Arcollab leadership team brings more than 55 years of combined professional experience. “We are fluent in the architectural detailing of styles ranging from the historic and neo-traditional to cutting-edge modern design,” said Smith. “From the overall massing of building forms to the careful assembly of construction details, we combine a strong understanding of construction systems, attention to clients’ needs and budget, and an artistic sensibility,” he added. For more information on Arcollab, please visit: http://www.arcollab.net. Phone: 706.355.3010. In 2006, Newcomer moved to Athens, Georgia and started Bork Design, Inc. Her innovative and award-winning modern home designs have changed the face of residential architecture in Athens, where she has designed over three dozen custom homes. Newcomer’s work has received awards from the U.S. Green Building Council and the Athens-Clarke Heritage Foundation, and has been published in EcoHome magazine, Green Building and Design magazine, Atlanta Home magazine, GreenSource magazine, inhabitat.com, and in the book, LEEDING THE WAY: Domestic Architecture for the Future. Her work has been featured on the Modern Atlanta and the Modern Athens Home Tours, and has won Best of Houzz awards for five straight years, 2013-2017. She is a registered architect in Georgia. With 21 years in professional practice, Joe Smith was a founding partner in Hall Smith Office (HSO). Since moving to Georgia in 2005, Smith has participated in the restoration and/or renovation of more than seventy-five historic structures in the state. A core specialty of Joe’s architectural practice has been the recording, assessment, and rehabilitation design of historic buildings of myriad types, sizes, and periods. Smith’s work has received awards from the Georgia Trust for Historic Preservation and the Madison Historic Preservation Commission, and has been featured on houzz.com. He has been published in the Wall Street Journal, Elle Decor, Fine Homebuilding magazine, Interior Design magazine, and in the books Madison: A Classic Southern Town and The New American Dream: Living Well in Small Homes. Smith is a registered architect in Georgia and New York. Comstock has 16 years of professional experience focused on the integrated delivery of high quality design solutions. His focus is on design and technical development, building systems integration to manage projects’ building information modeling (BIM). Comstock was a student participant in the famed Rural Studio at Auburn University. His design-build student thesis received an Honorable Mention from the Archiprix International Competition for the world’s best graduation projects. In addition to his design-build experience with the Rural Studio, he was a co-founder of EcoStudio in Denver, Colorado. EcoStudio’s mission was to build spec homes with a distinctive commitment to modern architecture and sustainability. Comstock is a registered architect in Colorado, Georgia, North Carolina, and Tennessee. Arcollab includes (left to right): Annie Jenkins, Kayli Read, Joe Smith, Lori Bork Newcomer, Gabe Comstock, Quint Newcomer, and Alia Griffith. Photo Credit: Jason Thrasher, Thrasher Photo + Design.